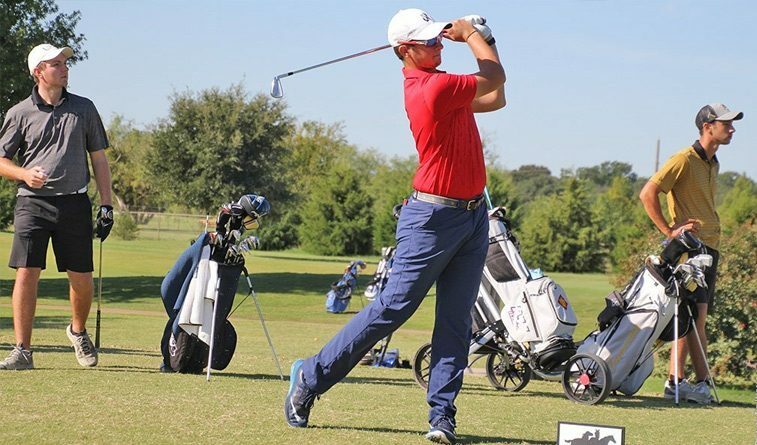 HORSESHOE BAY, Texas (April 24, 2017) – On a day when not much seemed to go right for Oklahoma Christian in the Heartland Conference Championship, one Eagle found the formula for success at Apple Rock Golf Course. OC’s Juan Pallach fired a 2-under-par 70, capped with a birdie at No. 18, to move into sole possession of second place after two rounds at 142. The sophomore from Mexico City will enter Tuesday’s final round one shot behind Zach Partin of Arkansas-Fort Smith. The individual champion will receive an automatic berth in the NCAA Division II West-South Central Super Regional. Unfortunately for the Eagles as a team, they combined to post 11 double or triple bogeys during the round and slipped from second place into a tie for sixth in the 10-team field. OC’s team score of 307 put the Eagles at 601 through two rounds and they trailed the leader, St. Mary’s (Texas), by 19 shots. Pallach is one of two returning starters from the OC team that qualified for last year’s NCAA Division II Championship and has played like it in his first postseason event since then. He was 6-under through 10 holes on the 6,867-yard course during Sunday’s first round before settling for an even-par 72. He opened Monday with another birdie at No. 1 and had only one bogey the rest of the way. Pallach is one of only five players in the 50-man field who hasn’t posted an over-par round this week. Sophomore Ethan Smith was OC’s only other top-20 player, in a tie for 20th at 150 after shooting a 77 on Monday. Junior Eric Hill posted an 82 and was 32nd at 155. Two shots further back was freshman Michael Robinson, tied for 35th at 157. At 158 was sophomore Ryan Trousdale, who fired a second straight 79 and was tied for 37th. The Eagles will be grouped for the final round with Texas A&M International and Rogers State. OC will tee off starting at 8:50 a.m.
Rogers State men’s golf sits tied for sixth following Monday’s second round as the Hillcats shot 300. Hagen Barmasse shot 75 Monday while fellow senior Eric Moore shot 2-under par 70 as the Hillcat duo holds a 145 36-hole total for a tie in ninth. Ewen Delample carded a 74 for a two round total of 153 and tied for 27th. Junior Alex Marsh improved by three-strokes in the second round with an 81 for a tie for 44th with at 165. Tied in 44th with Marsh is Patrick Bart after the fellow Englishman shot 88 Monday. Live scoring updates will be provided at GolfStat.com.